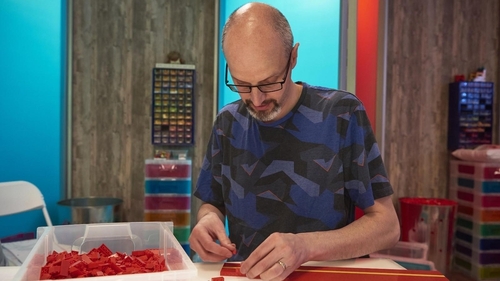 The hunt is on for the UK and Ireland's best Lego builders, as some of the two countrys' most skilled brick fanatics do battle to be crowned Lego Master. In the first episode, 48 pairs are whittled down to just eight final teams through a series of challenges. Next, the eight teams must create a spectacular brick banquet, including an impressive chair that not only looks the part, but also strong enough for presenter Melvin Odoom. The teams must also make at least one supersized masterpiece for the banquet table. The results include a crispy aromatic duck and prawn toast, a hog roast, and a gravity-defying cup of tea. In this very personal documentary, award-winning reporter and news presenter Mark Austin and his daughter Maddy explore the devastating impact of eating disorders. After they publicly spoke out about their experience at the start of 2017, they have been inundated with messages of support from across the UK. Meeting patients and relatives, Mark and Maddy explore the lengthy waiting lists for treatment, the extremely limited number of beds for people with eating disorders and the postcode lottery that determines the level of care that patients receive. The eight-part observational documentary series returns, this time with unparalleled insight into Britain's West Midlands Ambulance Service. Each episode follows the call-handlers and ambulance dispatchers in the highly pressurised control-room, and the paramedics, technicians and specialist Air Ambulance crews out on the ground. In episode one, it's Saturday night, and West Midland Ambulance Service takes a call from a distraught woman whose husband has collapsed on their lounge floor. This documentary follows the fun, surprising story of a group of men, all over the age of 90, as they pursue their dream of becoming world champion athletes. This new series examines what goes on in our overseas Embassies, advancing Irish culture, interests and values. Episode one features Ambassador Geraldine Byrne Nason in Paris and in New York, Consul General Barbara Jones. Award-winning comic actor and stand-up, Nick Helm sets out on a highly personal culinary journey around the UK and Europe in this brand new series. It's a foodie show that's part-comedy, part-travelogue and part-restaurant review and it kicks off in the London suburb of Islington, where Nick shares a chop with Bob Mortimer. It's a toss-up between this and Insecure (10.35pm, Sky Atlantic), so we'll give you a line or two on both. On Insecure, Issa has her newfound confidence shaken when she spends time at a day party. Elsewhere, Molly has a blast from the past when she spends time with a childhood friend, and an everyday trip to the shops turns into a wild night for Lawrence. Tonight's episode of HTGAWM sees Annalise and her students take on a case defending siblings who have been charged with conspiracy to commit murder against their mother. Meanwhile, Frank’s actions lead to a painful consequence.